Winter is coming in the new season of HBO's "Game of Thrones." 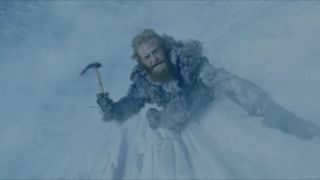 In this picture, one unlucky character succumbs to the power of the north. Winter is coming on the HBO series "Game of Thrones," but no one seems to be able to predict when. The planet's last summer persisted for seven years, while winter has been known to last a generation on the show. Understanding when the seasons will change is just one of the many issues plaguing the characters of the fantasy series based on the books by George R.R. Martin. Although science doesn't play much of a role in the fictional world — which comes complete with dragons, magic and a red comet that serves as an omen — planetary science could help explain the odd seasonal changes on the three continents in the TV show's universe. "Yes, seasons can last arbitrarily long times," Geoff Marcy, a veteran planet hunter at the University of California, Berkeley, wrote in an email to SPACE.com. Seasons are for the most part controlled by the way a planet leans toward or away from its sun. For example, the Earth's axis does not run straight through the planet. Instead, it has a slight tilt that points the Northern Hemisphere toward the sun during part of the planet's orbit (causing summer) and away for another part (causing winter). "The planet Uranus in our solar system has its North Pole spin axis pointed toward the sun during some 42 years, and then it points away from the Sun for another 42 years," wrote Marcy. "If you lived anywhere in the northern hemisphere, summer would last 42 years and then winter would last 42 years. So the spin axis orientation makes all the difference." Although Uranus' winter and summer might be extremely long, they are still predictable. On "Game of Thrones," no one knows when summer will end and winter will begin. It is possible that a "wobbly" axis could create variable seasonal length, said Greg Laughlin, an astrophysicist at the University of California Santa Cruz, but not necessarily on the timeline that show presents. A wobbly tilt will not create rapid seasonal changes over the course of years or even decades, Laughlin said. Variability in the length of season happens after thousands of years. In other words, the characters on the television show would not be alive to see a distinct change in the length of any of the seasons. Mars has a wobbly axis, according to Marcy. However, the Red Planet's seasons don't change from one year to the next. Instead, it takes thousands of years for the planet's axis to wobble enough to change the length of a season. Seasons are also dependent upon the kind of planetary system the exoplanet finds itself in, Laughlin said. "One situation that will lead to wildly variable seasons over long periods of time is if the planet in question is a member of a strongly interacting multiple planet system," Laughlin said, describing how a planet's orbit could be pulled out of whack by another planet. These changes would also happen over the course of thousands or millions of years, Laughlin added. But this also might be a good explanation for the seasonal issues on the "Game of Thrones." The third season of HBO's "Game of Thrones" premiers Sunday (March 31) night at 9 p.m. EDT. Check local listings. The books and TV show make mention of a second moon that disintegrated when it flew too close to its sun. Of course, in the book's lore that moon was actually an egg full of dragons … so maybe it would be best not to apply too much real science to this kind of fiction. The newest season of "Game of Thrones" premieres Sunday (March 31) at 9 p.m. EDT on HBO. Check local listings.